The financial crisis of 2008 had a severe effect on the shipping sector. Freight rates, especially bulk cargo freight rates, reduced in a level which made it impossible for shipowners to continue their business without losses. However, China is a big player in the bulk market and its demand for iron ore, generated by its economic growth and development may be a potential factor of future increase on the freight rates. This paper is aiming in investigating the sensitivity of freight rates in changes of demand and supply and also the effect a potential supply and demand increase would have on them. 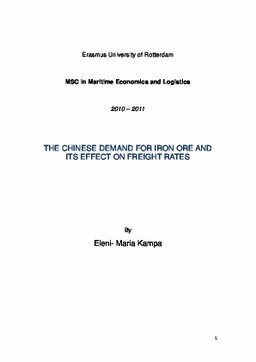 Main research question is: How sensitive is the iron ore drybulk shipping market, expressed in terms of freight rates, to Chinese demand for iron ore and the global supply of vessel tonnage? In order to answer the question regarding the sensitivity on freight rates, we first look at the factors that affect them. Since the price and the demand of iron ore are variables that influence freight rates and they are also interdependent with each other we will continue our analysis by investigating each one of them separately. The price of iron ore we believe that is highly influenced by five main factors. The total global iron ore trade, the price the spot market of iron ore is reaching daily, the negotiation power China has over foreign suppliers, the number of tonnage available on the market and finally by the quality of logistics services used in its transportation. However, we believe that the major role is played by the supply and demand equilibrium in iron ores market which can be examined by the quantities transported globally. An increase in demand should make the price of iron ore rise, if supply does not follow. Chinese demand for iron ore, is affected by the growth in Chinese GDP and also by the price of iron ore has in the market. We assume that an increase in iron ores price would decrease demand and in the opposite an increase in the GDP of China would boost demand for iron ore. Finally the reliability of suppliers is the last variable found in our literature review which can help an increase in trade. Finally, freight rates are the outcome of demand and supply interaction. In the demand side, we have world economy, iron ore trade, the average haul of the vessels, political stability and transportation costs. We believe that an increase in world economy, political stability and low transportation costs would boost trade and as a result decrease freight rates. The supply side is a sum of the new ships entering the market, the ones leaving the market or lost in some unpleasant situation and also the efficiency of the world fleet. An increase in vessels availability and in global tonnage is always negative regarding freight rates as it increases supply. Our quantitative analysis starts with a correlation analysis where we witness the general relationship between our dependent and independent variables. The major outcomes show that all the variables of the price of iron ore and of the Chinese demand for iron ore are positively correlated. On the other have we can witness a lot of negative correlations regarding the determinants of freight rates. However we noticed that an increase in traded quantities is positively correlated to freight rates and also we witnessed a positive correlation between the demand of iron ore and its price, things that were not expected from our literature review. The multiple regression method is then implemented in order to analyze the relationship between our data and our three dependent variables. Regarding the price of iron ore, we have three significant coefficients which are a -8.49 for the global iron ore trade, an 8.5 for the LPI index and finally a 0.16 regarding the spot price of iron ore. As far as Chinese demand for iron ore is concerned, great significance was shown by the Chinese GDP growth with a coefficient of 0.34, by the Australian and Brazilian exports with a coefficient of 0.33 and finally by the price of iron ore with a coefficient of 0.41. The outcome of this method regarding freight rates is a negative coefficient of -0.05 for the new buildings rate, a negative -2.14 for the scrapping rate, a positive 1.93 for the logistic price index and finally a 0.08 for the Chinese exports over GDP. All the aforementioned coefficients are highly significant. Looking then on how the future may look, we run a partial equilibrium model (GSIM) in which we use our data regarding the iron ore trade and our global predictions of future growth in order to get an outcome for 2015. We implement three different growth scenarios (a low, a medium and a high) and we can see that a 2.5 percent increase in Chinese demand can lead to a 22.6 percent increase in iron ore trade and a 7.5 per cent increase will lead to a 22.8 per cent increase in trade. Finally we use the outcomes of the aforementioned methods and models in order to see how much the increase in trade will affect the freight rates. However, we conclude that a 2.5, a 5 and a 7.5 per cent increase in demand would not be able to change today’s situation as the freight rates will be kept a bit higher, around 19$ per ton. As a result we can see that there are higher powers that the trade itself that are keeping the freight rates in the low. New building vessels falling daily in the market, increasing the Capesize available tonnage, better logistics services and lower scrapping rates are of great importance in the determination of today’s freight rates.